PHOTO: Allen Ramsey, DWCPhoto.com. Highlands sophomore Taylar Lorenzen receives a five from Head Coach Rob Coffey after a three-run home run in the second inning. The Bluebirds beat Dayton, 10-7 to win the 36th District championship. Both Blue and White squads smashed their way into the district championship games. 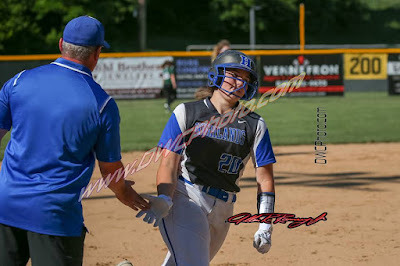 It turned into a matter of the heavily favored Highlands Bluebirds baseball and softball teams bringing home more 36th District gold trophies and earning the best possible seeds in the 9th Region Quarterfinals on Thursday. Both teams did it in two completely different fashions bringing the total to six district championships out of the the seven 36th District sports for the most in an academic calendar year since the soccer teams went to that format starting in 2012-13. The Highlands baseball team (23-13 overall) sent 15 batters to the plate in the bottom of the second inning scoring 10 runs on eight hits and two walks to build a 12-0 lead on its way to a 13-1 five-inning run-ruling of the Newport Central Catholic Thoroughbreds (18-13) at Highland Park. That marked the seventh straight district championship for the Bluebirds and the 11th straight win for Highlands over NewCath. "We talked from the time districts started about taking the one-and-out approach," said Jeremy Baioni, Highlands Head Coach. "While both teams that played (Thursday) are going on to the regional tournament, we feel it's really important to have momentum going into the tournament and going in on a positive note so we approached it as if it was a one-and-out. We wanted to play well and we did. We played really well defensively. We swung it well both days and we got great pitching both days. Those are always formulas for success." Down the road at Veterans Memorial Park in Newport, the Highlands softball team (18-10) built a 10-2 lead on the Dayton Lady Devils (10-8), but had to hold off a Dayton rally in the seventh inning to win 10-7. Highlands had a three-year district championship game winning streak snapped by a 12-5 score to Newport Central Catholic last year. 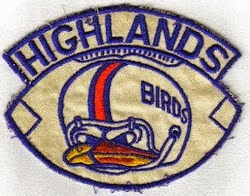 "We talked about focus again," said Rob Coffey, Highlands Head Coach. "We have a new season that starts Monday. We have a tendency to lose focus every once in a while. That's what happened in (the seventh) inning. Thank goodness we had some kids jump in the line-up that don't always get their opportunities that got their opportunities and took full advantage of it." On the other side, this marked the first-ever appearance in the 36th District championship game in fast pitch softball for the Lady Devils. Head Coach Beth Fields-Hunt took over in between the 2011 and 2012 seasons. Dayton had won just one game in 2011. "It's a really big step for the kids. It was on their goal list at the beginning of the year to beat some of the teams in our district that we usually struggle with and make it to region," Hunt said. "If there's one thing I see about the kids I coach is that they have true grit. They have heart. They love the game and they will not role over to anybody." Highlands hit the ball well again going 14-for-30 for a .467 average. The Bluebirds also took advantage of two walks and two Dayton errors. Sophomore and Tournament Most Valuable Player Taylar Lorenzen fell a triple shot of the cycle going 3-for-3 with a three-run home run, double, three runs batted in and two runs scored. "I'm here for my team. We had to get that big hit," Lorenzen said. "Those three runs really counted. Our team has to come together every game. We have to keep going and push through all the mistakes. We pushed through and came out with the win. You have to adjust to every single pitcher." Seniors Josie Daley, Baylie Ormes and eighth grader Addie Mack also had big games offensively, Daley and Mack both went 3-for-4. Mack had a double, one RBI and scored twice and Ormes went 2-for-2 with four runs batted in, two doubles and one run scored. Freshman Caroline Class scored both times pinch-running for Daley. Ormes also made the all-tournament team. Highlands eighth grade pitcher Gracie Schlosser threw a complete game striking out six, hitting one and walking one on her way to an all-tournament selection. Dayton hit 7-for-27 against her for a .259 clip. Schlosser retired the side in the first, fourth and fifth innings. The Bluebirds committed two of their three errors in the top of the seventh. But Schlosser shared some of the responsibility for not putting the game away better. "I just have to work on throwing more strikes for my team," Schlosser said. "I just can't give up a walk for no reason. Then I have to make the plays for me. I also have to work harder. I can't get tired in the later innings. I still have to pitch my fullest. I have to pitch as fast as I possibly can. I have to give everything that I got for my team." Dayton saw just one batter have two hits in junior Emma Donelan. Donelan went 2-for-4 with a double, three runs batted in and a run scored. Highlands struck first in the bottom of the second inning. Mack singled and took second when Daley singled. With one out, Lorenzen blasted a home run off Dayton pitcher Tatum Turner over the wall in left center field. Dayton scored once in the third inning when sophomore Jewels Ashcraft scored on an error. But Highlands responded with two more to go up 5-1. Senior Liz Mairose singled scoring Mack and Class. The Bluebirds added another run in the fourth to go up 6-1. Eighth grader Anna Greenwell reached on a fielder's choice and scored when Ormes doubled to the gap. Dayton cut the margin to 6-2 in the sixth when senior Megan Downard scored on a Donelan double. But the Bluebirds scored four in the bottom of the frame to go up 10-2. Lorenzen doubled and moved to third when sophomore Piper Macke reached on an error. Greenwell walked to load the bases and Ormes cleared the bases with a three-run double. Ormes took third on a Dayton error then scored when Mack singled her in. "It was really hard for me to get adjusted at first because of the slower pitches," Ormes said. "But I just stayed back and I kept my hands above the ball. I just drove it and ended up taking two bases. I always trust my coaches and I don't ever look at the ball." Dayton loaded the bases. But Highlands got freshman Liberty Windeler to ground to Mack at third. Mack threw home to Daley to record the force at home before Downard flew out to center. Junior Grace Workman walked with the bases still loaded to score Ashcraft before Donelan doubled in two. Donelan then scored on a Highlands error. With a runner on first, senior Mikayla Lovins flew out to Macke in left to end the game. The baseball team dominated the district championship led by senior pitcher Drew Rom and error-free defense. In five innings, Rom struck out 11, walked one and allowed just one earned run and three hits. NewCath batted .167 (3-for-18) as a team. Highlands went 11-for-23 for a .478 batting clip. Seniors Sam Hennigan, Bryce Ziegler and Tyler Gulley went 2-for-3. Ziegler had one run batted in and scored twice and Gulley had three RBI and scored once. Hennigan scored once. Senior Carson Fitters had a three-run double in his lone at-bat before scoring. Rom also had a double and RBI. Senior Joe Steiden scored three times and senior Grant Summers scored twice. "It means a lot to everyone. There are 10 seniors," said Mason Schwalbach, Highlands sophomore. "It goes to show every one of them cares a lot to be able to go out there and put everything on the line every single inning, every single out." Junior Trent Johnson has not been able to play this year because of injury. But he is still doing what he can to encourage his teammates. "It's really awesome to see the guys play their hardest and give it all the got knowing what's on the line and that this team can be really special," Johnson said. "Now that we're in the (tournaments) if you slip up once, you're season is over so you have to go out there and play with the same mentality like, 'This is it. This can be our last game.' You just have to play to the best of your ability and try to get the win." The district tournament draws take place in the next couple days. The Bluebird teams will take on a runner-up from either the 33rd, 34th or 35th Districts. The baseball team could face Dixie Heights, Ryle or Beechwood in the 9th Region Quarterfinals at University of Cincinnati Health Stadium. The softball team could face Boone County, Covington Holy Cross or the loser of the 34th District championship game Friday between St. Henry and Dixie Heights back at Veterans Memorial Park.